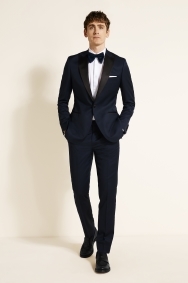 Move away from black to make a statement at formal occasions. 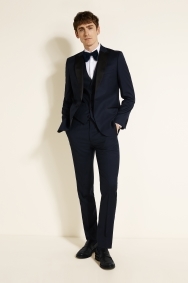 This suit will make sure you look sophisticated but with personality thanks to the navy colour and on-trend peak lapels. 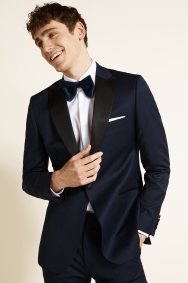 Nevertheless, you can still be confident that you’ll look the part as it features a single-button fastening, satin detailing and a defining tailored fit. Made from 100% wool it has a refined, smooth finish. For a relaxed take on formalwear, team with a white shirt, silk tie and simple pocket square. 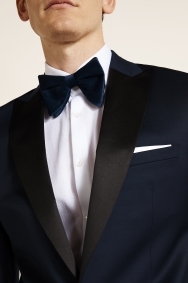 You can dress it up when you need to with a navy bow tie. Same as before. Really same. FOR MY PARTNER, WHO LOVED IT - VERY SMART AND VERY WELL MADE, ESPECIALLY WHEN THE PRICE IS TAKEN INTO ACCOUNT. TRUE TO SIZE.